by Michael Erskine MANITOWANING --- The Assiginack arena became a rollercoaster construction zone last week, as Pierre Harrison of PLAYLearnThink was in town to hold recreation workshops on mass, gravity and how to build your very own science fair rollercoaster. Some people may think that learning should be all work and no play, but Mr. Harrison's approach is that learning can be fun. Watching him at work is a fair example of the fact, because he is most definitely having fun as he guides his young charges through the fundamental laws of physics. "Why shouldn't science be fun?" he asked. "When you stop and think about it, there is science behind all of the things that are fun." Using a string harness, a glass of water and a small wooden platform, the young scientists are easily induced into swinging the glass of water briskly upside down. To anyone familiar with the laws of physics and how gravity works, the security of the glass of water is never in doubt as it swings in rapid arcs overhead. But when it comes to stopping? Pierre Harrison guides budding young scientists through the intricacies of rollercoaster construction during the Assiginack Science Camp series. Nicole Moggy, 10, and Chris Case, 9, have some great plans on paper that they are now turning into reality. There is another question. No worries with Mr. Harrison in charge, however; under his careful explanation, the swinging glass of water comes to a gentle, and unspilled, stop. 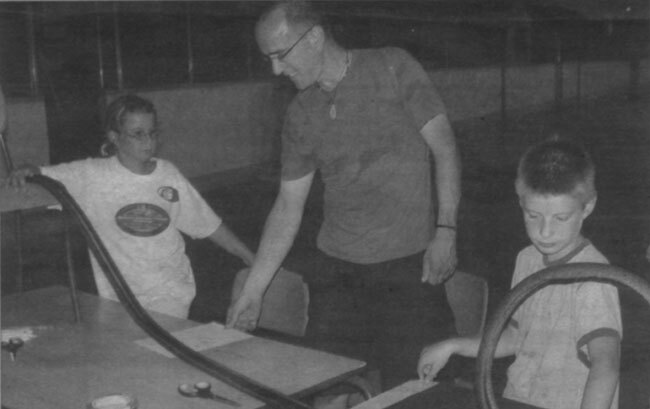 After he is certain his young scientists have the basics firmly in mind, Mr. Harrison brings out the lengths of one-inch pipe insulation that form the basic construction material for his marble-bearing rollercoaster design. Students spend a few moments diligently hovering over pieces of paper on which they sketch their initial designs before they begin the actual construction. "It's important that they go through the whole process," he said. "They learn a lot from putting their designs down on paper and then trying to turn them into a finished product. They learn about the limitations of the materials and what works and what doesn't." Mr. Harrison will be performing his science magic at workshops during this week's Great Manitou Star Party in Aundeck Omni Kaning.